KIEV, Ukraine -- Wassyl Slipak, a baritone at the Paris Opera who became a folk hero in his native Ukraine for returning home to fight in his country’s war in the east, was killed by sniper fire on Wednesday near the town of Debaltseve. He was 41. 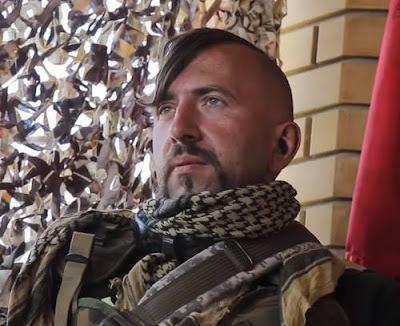 Mr. Slipak died around 6 a.m. after his position came under a surprise attack, said Artyom Skoropadsky, a spokesman for Right Sector, a nationalist paramilitary organization. Mr. Slipak was born in the western city of Lviv on Dec. 20, 1974. A musical prodigy as a child, he rose quickly to fame performing in France in the late 1990s. By 2011, he was at the top of his field, winning the prize for best male performer at the Armel Opera Competition and Festival in Szeged, Hungary, for his rendering of the Toreador Song from the opera Carmen. But after the war with Russian-backed separatists broke out in eastern Ukraine in 2014, he traded the stage for the trenches, carrying a belt-fed machine gun with other right-wing volunteers in Right Sector. He adopted a traditional Ukrainian hairstyle, similar to a Mohawk, and served at various positions along the front line — a maze of trenches and minefields that surrounds separatist territory. Mr. Slipak, who had won fame in France for his renditions of the aria of Mephistopheles from the opera “Faust,” adopted the nom de guerre Meph. In an interview with Hromadske TV, a Ukrainian station, Mr. Slipak had said he was inspired to serve his country by the popular uprising on Maidan Square in Kiev, though he had been living in France since 1996. “Ukraine can become a successful country and a major player on the political stage if we start heeding the voices of the people,” he said in the interview. Right Sector, originally an umbrella organization of far-right groups, including some with neo-Nazi leanings, is vilified in Russia as a fascist organization. Right Sector denies it is neo-Nazi. Euromaidan Press, a Ukrainian news website, quoting a field commander, said Mr. Slipak’s survivors included his parents and an older brother. A city spokesman in Lviv said Mr. Slipak would be buried at the historic Lychakiv Cemetery, which is reserved for notable local figures. Mr. Skoropadsky said: “Ukraine this year celebrated 25 years of independence, but it was real independence only after the Maidan, when a real state started to form. Here we have an example of a person who left his career to fight. Mr. Slipak would sometimes sing for his fellow soldiers at the front, Mr. Skoropadsky said. In the public television interview, Mr. Slipak is shown singing the Ukrainian folk song “Moon in the Sky” as he loads his gun, snapping bullets into the magazine in time with the music.